My alarm clock knocked at my dream warped mind at 3:30 in the morning. Early enough that the cob webs hadn’t fully cleared, as a good night's sleep ought to do, so the sound of it's chime stretched for minutes before my transformation to wakefulness could be mustered. I grabbed the clothes I had set out — most important among these, the long underwear that would make the near freezing temps of predawn bearable — and I fumbled to get dressed. I was out the door within 10 minutes. As I sat in my hatchback preparing to head out, I reached a hand out to touch my camera and tripod, an assurance that they were in their rightful places. They were. I'm was ready to meet The Milky Way, our Torch Lake tryst awaited. I wound down the forested corridor from our hillside home. The quaint villages of Bellaire and then Central Lake — where the only thing awake were the street lights —faded into my rear view. My mind's eye was lost in anticipation. The ideal window of time for milky way viewing was now. The weather at night hadn’t been this clear in some time and the moon was good and dark, offering me this perfect chance. All the research and preparation had been done. 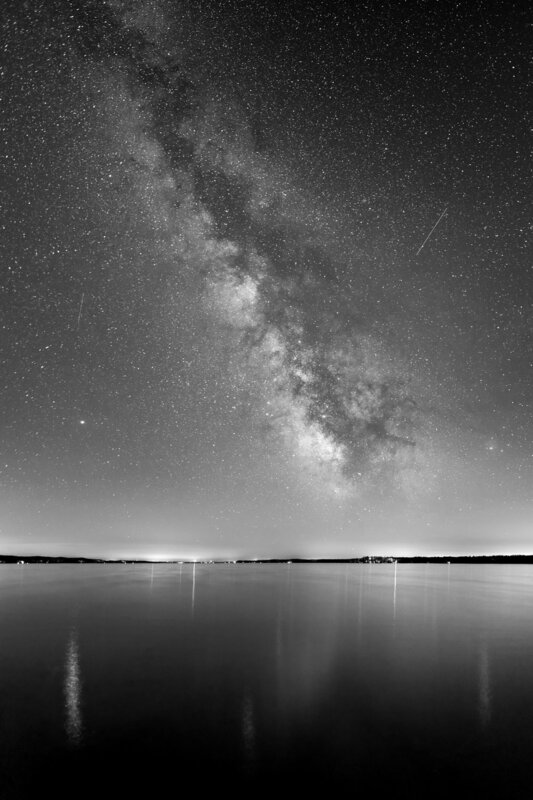 When I looked south across Torch Lake’s 19 mile expanse, I could only hope the water and stars would be in dazzling alignment. Out of town the road led through farm country. Old barns and the outskirts of orchards were alight and then gone, as my headlights cast ever onward. It was five minutes until arrival. Would my vision match the starworld that was waiting in Easport? Car parked. Tripod assembled. Camera set. I walked out onto a dock, eyes dilating from the near blackness, as the cold of this deepest hour of night gathered near the lakeside. Beyond the inky void of water, like an otherworldly pointillist painting, an explosion of starlight shown from the horizon. Ten million stars blinked at me from the galactic center of our galaxy, with her spiral arm arcing up and beyond my sphere of view in a dizzying display of grandeur. She was more lovely than I could have imagined!